This practical, rugged, feature-filled model converts instantly from a student desk to a mobile computer workstation. The electrically powered monitor lift provides a desk top that is instantly power adjustable to fit a student of literally any size. Keyboard tray is also height adjustable and is designed to accomodate left or right-handed students. This logical, ergonomic solution is ideal for for class rooms, computer labs, library and home use. Model K-4A is a Grow-With-Me style. Older students/adults See Model LS-512. Summerland believes that interfacing very young students with computers; giving them access to the Internet, and teaching them to use the computer as a major part of day-to-day educational instruction, is the most efficient method for obtaining exemplary educational results - - at the lowest cost. Summerland presents a patented product and facilitating system program which permits integration of student use computers into classroom and home environments. Because The Learning Station brand development is dependent upon both public and private sector support and acceptance, particular attention has been given to our being able to anticipate and accommodate requests and responses from educators, regulatory agencies and public interest groups. Our strategic plan is to provide economically justified computer workstation desks; designed to aid both school and home decision makers with their need to responsibly acquire and manage education use computers, and to be able to communicate solutions to their cost and use concerns. 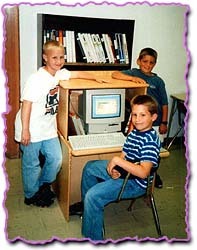 From kindergarten to college and on into adulthood, computer users come in all shapes and sizes. The Learning Station adjusts to meet specialized requirements of growing students from K-12 and beyond. The Learning Station provides what's needed for each of them, regardless of age or height, to work safely, and ergonomically. It helps eliminate functional obstacles so that students can devote their attention to learning. Look closely at the photos at right. Do it with a critical eye. This is representative of typical computer installations in elementary, secondary, and university classrooms throughout the country. Assess the height variation between students. Evaluate eye-angle, typing angle, note excessive distance from screen, and in some cases, forearms forced against table edge for long periods of time. 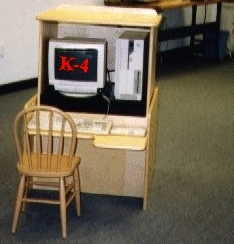 Yesterday's typical "drop it on the desk" method of installing computers in schools and training facilities has created a widespread ergonomic problem that can be quickly and easily solved with The Learning Station. You've used a button to adjust a seat in an automobile. It's exactly that easy to adjust The Learning Station for comfortable computer operation. AT LEFT: Model K-4, designed specifically for K-4 students. The electrically powered monitor/CPU platform allows each student's monitor viewing and keyboard working height to be precisely adjusted (desk top height is fully adjustable too). When done computing, the computer & monitor are securely stowed out of harm's way. Model: LS-512 sized for 4th grade through university students. Measures 28" wide and 24" deep. Slide forward desktop is standard on the LS-512 model, corners are rounded for safety on school models. Model: LS-512P Optional design for The Learning Station has below-desk monitor mount with glass viewing port . Adjustable height monitor, keyboard tray and desktop. Measures 28" wide and 24" deep. The first and only adjustable "paralax" style desk. Model: The OFFICE-LS Measures 28" wide and 24" deep. Slide forward desktop is standard. Fine-furniture finish, with cabinet doors. A space and desk/enclosure layout optimizing placement of the monitor, its controlling keyboard and mouse. Critical considerations for The Learning Station are: Positioning of the display relative to work surface; providing mechanical protection of the monitor and CPU from damage; sizing and arrangement of the work station desk top to allow adequate space for regular use of height adjustable desktop. During computing, student performance is enhanced and fatigue reduced because monitor height and view angle changes can readily be adjusted at regular intervals. The infinite adjustabilty of the LS-512 and K-4 models of The Learning Station offers a particularly significant advantage over below-desk monitor desking systems. Recessed monitor viewing, (monitors affixed at a 45 degree angle below the desk surface, often separated from the viewer by a thick glass screen), with monitor located significantly further from the eyes, can be enormously useful to those for whom they were originally designed. (i.e. - bifocal wearers), but for the majority of computer users, and their workplace-safety conscious employers, and particularly for growing school children, this style of monitor viewing has the potential to create serious problems. Read comments on staff feedback by a representative of Michigan's Northville District Library (mirrored here for faster loading). Ergonomics is the science that seeks to fit the job or task to the individual rather than expecting the individual to conform to the job or task. It seeks to adapt work or working conditions to suit the worker. 1.Sit with your lower back against the chair and your feet flat on the floor or on a foot rest. 2.Adjust your table and chair so that your elbows are bent at right angles and your forearms are approximately parallel to the floor. 3.Keep your wrist neutral (straight) by using a wrist rest that is the same height as the keyboard. 4.Place your mouse on a surface close to and at the same height as your keyboard. 5.Position your monitor directly in front of you, approximately an arm's length away, with the top of the screen slightly below eye level. Tip the monitor back at an angle similar to that used when reading a book. 6.Use a document holder to position work at eye level. 7.Adjust your lighting and monitor to prevent glare or use an anti-glare filter. 8.Use adjustable tables and chairs to correctly position the keyboard or monitor. Computer assisted learning, melded with The Learning Station's functional workspace, is a practical system solution for education and training. "...by the year 2000, the United States will be first in the world in mathematics and science achievement." Every citizen of the US, and of the world, recognizes the vital impact of maximizing quality of student training to national and individual student development. The ability of schools to develop future leaders is based on every citizen having complete confidence that responsible utilization of technology is a functional part of education's' operational protocols. Each component of Summerland's educational products, and systems for their use, must be structured to earn and honor that trust. Our program accommodates a wide range of resource use planning action alternatives. Governments, academia, private corporations, communities and individual citizen groups have commenced initiatives to improve quality of public education in the U.S.. In part, these initiatives have grown out of public outrage over published studies showing for example: that today's U.S. college graduates possess basic knowledge levels equivalent to high school graduates in other countries; that 34% of 1998 U.S. high school graduates would not be able to successfully pass GED requirements and, The Third International Mathematics and Science Study results which defined severe US K-12 student learning shortcomings in mathematics and science. We examined student computer use to determine habits, practices and attitudes of computer-using student, teachers and administrators. We listened to parents, their children and educators. We learned how critical school cost factors were - - and, discovered a way to assist school personnel and faculty to rapidly implement an affordable practical program. US and international programs are in place to stimulate expanding use of computers in schools, and for students use at home. US Funding (federal) to establish internet links to every school and (state and local) programs for provision of in-class room computers facilitate implementation of new computer teaching protocols. Summerland's approach is to assist decision makers to reach workable decisions - - making certain that computer use is programmed with broad consideration of economic and educational options. An important product solution for home and classroom education. Dim: 43" wide x 47" tall x 34"d.
Preschoolers through 4th Grade and above. Equip: Give the kids the perfectly good computer you're upgrading from. Dimensions: Footprint 30" x 30", Desk Top 29 � " x 21 �"
Desk Top fully power-adjustable height Range 24" - 42"
Keyboard/write platform height adjustment range 18" - 22"
No Assembly Required. Convertible, it doubles as a craft & coloring desk. Older than 4th grade? It also converts to a POP-UP TV. Optional Booster-Base. Extends the Grow With Me capability. Construction: Wood. Birch. The real thing. Price: K-4 model Just $593. Isn't The Learning Station a better idea? Models for all kinds of applications.